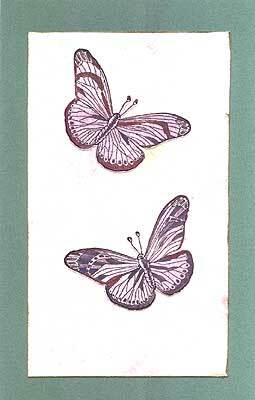 “Butterfly #2, Lg.” is embossed in black two times on mauve marbled paper. The butterflies are painted with metallic iridescent paint, cut out and layered on the mauve paper that has been edged with a gold Krylon leafing pen. This is layered on sage card stock. Card by Terri Johnson.